Good Afternoon, sorry I'm a bit late! 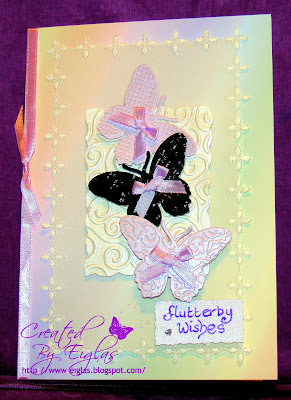 Thank You for your entries to our embossing challenge, you sure do love that technique either wet or dry! Winners will be announced n a couple of weeks, sorry if you haven't had a visit yet as several members of the team are still struggling to log into blogger! 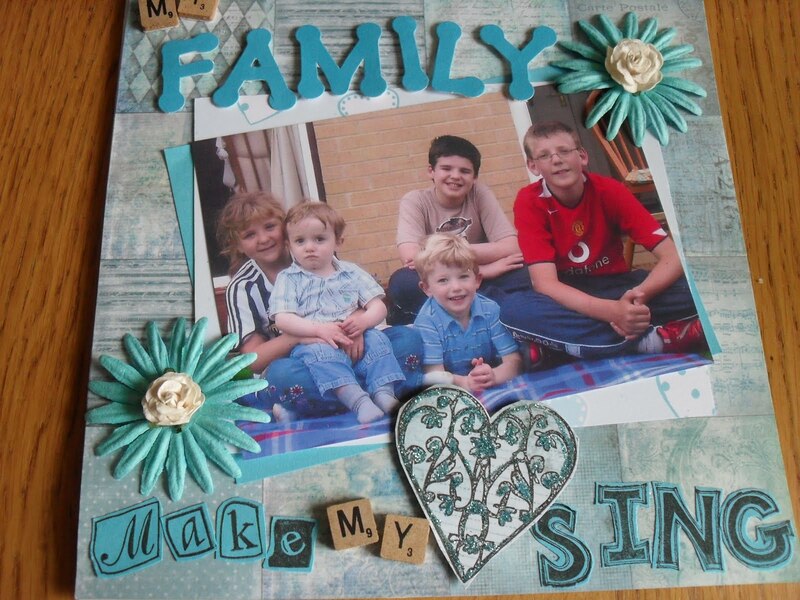 Our challenge for you today has been set by Benita and she has chosen the theme "Love the lasting kind" She would like to see you create something for someone/something you love and why. There's a lot of teens leaving school and uni this month so a great time to show you care! 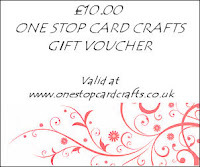 We are sponsored for this challenge by The Stampman who are offering a £10 voucher to use in their store, it has a huge amount of crafty items from ribbons to papers to paints and messy things! Please do pop over as its an aladdins cave for the crafter at great prices! Over to the girls and what they've created for this challenge! Thanks Benita for the lovely challenge of Love, who and why. I chose my grandchildren, well 5 of them, the 6th was having an afternoon nap. “My Family Make My Heart Sing”. 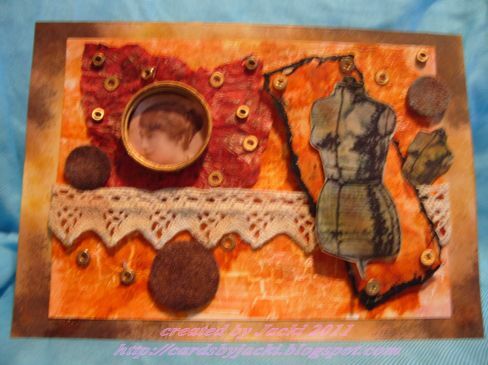 The background paper is from Tim Holtz Vintage Shabby Paper Stash. I stamped two of the words, added Scrabble tiles and used die cut letters. The heart is a stamp from Papermania, to which I added some glitter. 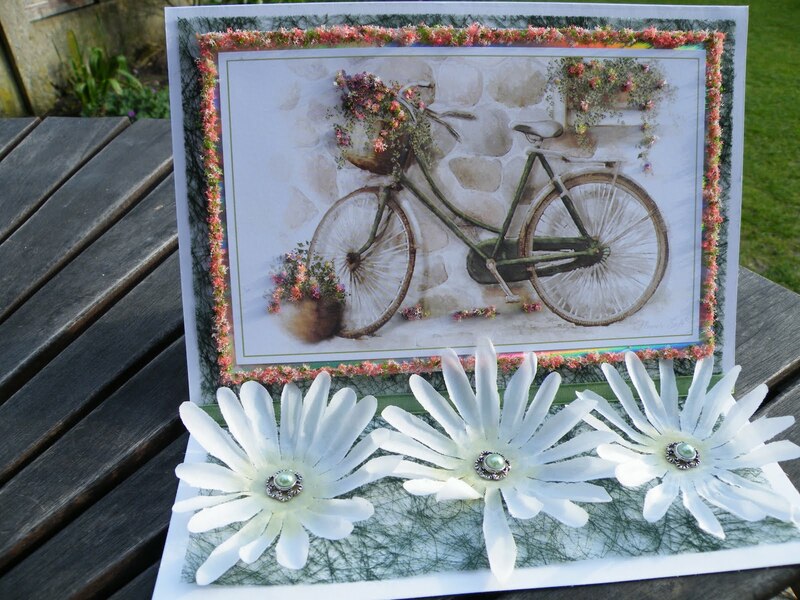 This is the first time I have used a photo to make a card, I am pleased with the final outcome. 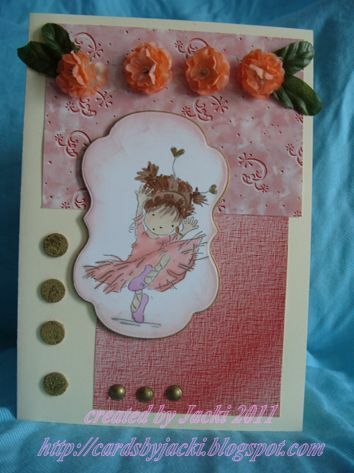 This was a wee challenge for me, only trying to decide who I should be making a wee card for! In the end I picked my Brother! I miss him so much especially just now, with him doing "secret stuff" with the Navy and Special Forces! 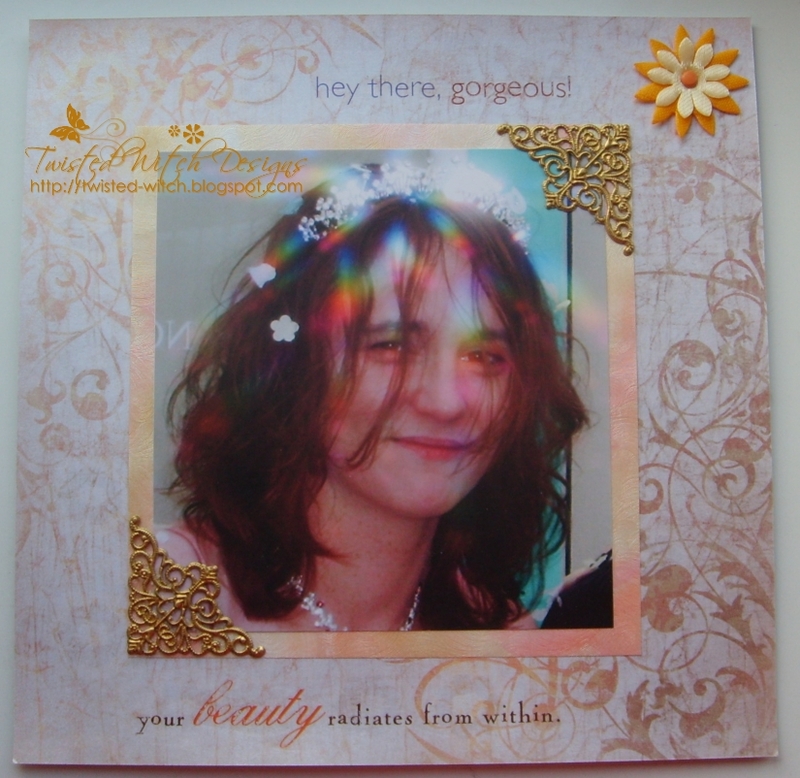 So I decided to make a wee card using the picture of us before he gave me away! The papers are from my new First Edition Stack, Martha Stewart Butterfly punch and a wee Sibling Quote I found online. This was a hard challenge for me, partly because I don't do 'overly sentimental' things. And anyone who knows me well would be worried if I suddenly did a card like that! I also don't put photographs of my family onto public sites like blogger. (Or even use names, so it's has been brushed out of the photos.) Instead, I went for a bit of humour. My daughter is our youngest, and she's in the midst of AS levels at the moment. She's clever, but she's found it difficult this year, and she's been working hard. So, I wanted to do something to mark the end of the exams, while reminding her that she's only half way there! I think she'll find it funny - she's definitely got a good sense of humour, and she's someone who loves to mark occasions with a card or other creation. The two digi stamps are coloured with Promarkers, and the piles of books are permission free images that I've added titles to in Photoshop Elements! Unlike Josephine above me, I am a sentimental old softy. I made this for my Daughter to show her how I see her, which is with beauty radiating from within, as the sentiment says. She has been my rock, my joy and my laughter, since the day she was born when I looked into her little pinched up face and my heart was lost forever. Of course there were moments as she grew that were frustrating, but on the whole she has been a person to be proud of. One whom friends can call on and know she will be there, one who sticks up for what is right no matter what the cost to herself and one who has shown me more love than I could ever wish for. She has filled my heart with love and my life with delight and wonderment and has become my absolute best friend. Sweetheart I love you. We have the winners of challenge 43 and 44 plus a redraw for challenge 41. Please remember to claim your prize! 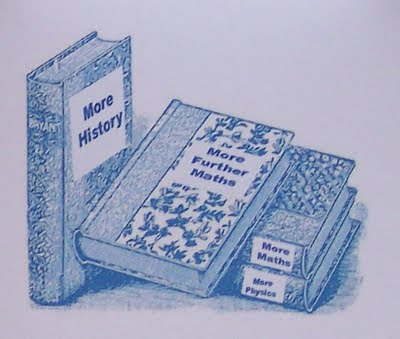 If for any reason you'd prefer to pass on a prize please also let us know so we can redraw it. Our Top 5 choices are below. Well Done all and thank you all so much for your entries! Please grab your blinkies above, if you're a prize winner please email me your details. Good Afternoon and welcome to our humble abode! Todays challenge has been set by Teamie Tracy so before I hand over to her just a quick Thank You for taking the plunge with our Steampunk or Machines challenge! There are some fab new images around for this rising trend which are lovely to see :) We shall be back with our winners catch up soon so do check back. I shall now hand you over to Tracy, its her first time hostng so be gentle! 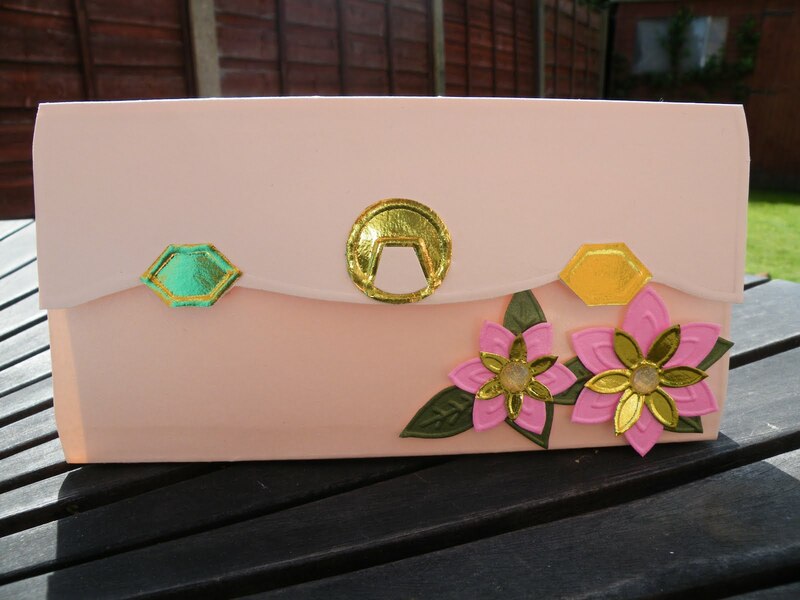 As a new(ish) DT member I'm very excited to host my first challenge, this time I would like to see EMBOSSING on your project. It can be heat embossing with your inks and embossing powders or dry embossing either by hand or using a machine so there is lots of scope for this challenge. We have a lovely prize from Joanna Sheen for this challenge - a £10 voucher to spend in her online shop which is packed full of goodies! Here's what we have come up with to inspire you, please do leave us a comment as we love to read them! 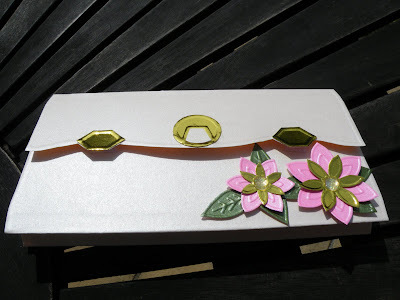 I used the Glitter Girls Dress to Impress embossing board to emboss this little handbag. All you have to do is emboss the shape, cut it out and fold the score lines. I embossed some extra details on the same board to add the catches using some mirri board. 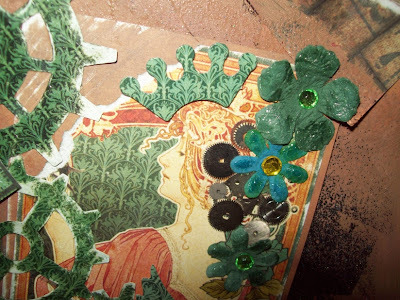 The flowers and leaves are also embossed this time using a Crafters Companion board, some glue and a few sparkly stones for the middle and job done. For this challenge, I have machine embossed the background, its a Tim Holtz texture plate that Ive fed through my cuttlebug and then just cut round the design, as you can see. My printer is now running out of ink and has made lines on my image but the image is so stunning that for me, I can still get away using it......the only either items Ive used is a printed acetate die cut by K&Co and the wording has been chopped out of another printed die cut item by K&Co. Now this is the card I did emboss the main BP is from MCS tattered lace cd rom then the silver strips are actually some tape we got to use on the car as we had a leak in the cooler tank didn't work so ended up having it and it embosses beautifully I used an embossing folder can't remember the name of it then I embossed the purple sheet with a different folder the image was cut amd embossed with a nestie and the the roses and bow I made myself dead easy. 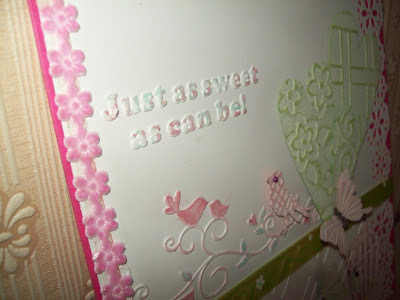 I've used heat embossing for this card. The background was stamped with a swirl stamp in gold ink, and then embossed with holographic clear powder. I edged the card with more of the gold ink. 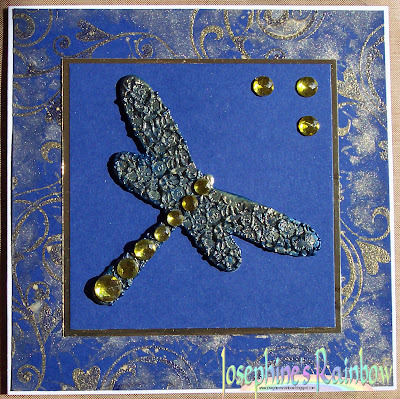 The dragonfly was plain chipboard, and I used multiple layers of blue ultra thick powder, followed by a top layer of gold. While it was melted, I stamped it with a background stamp from the V and A collection. 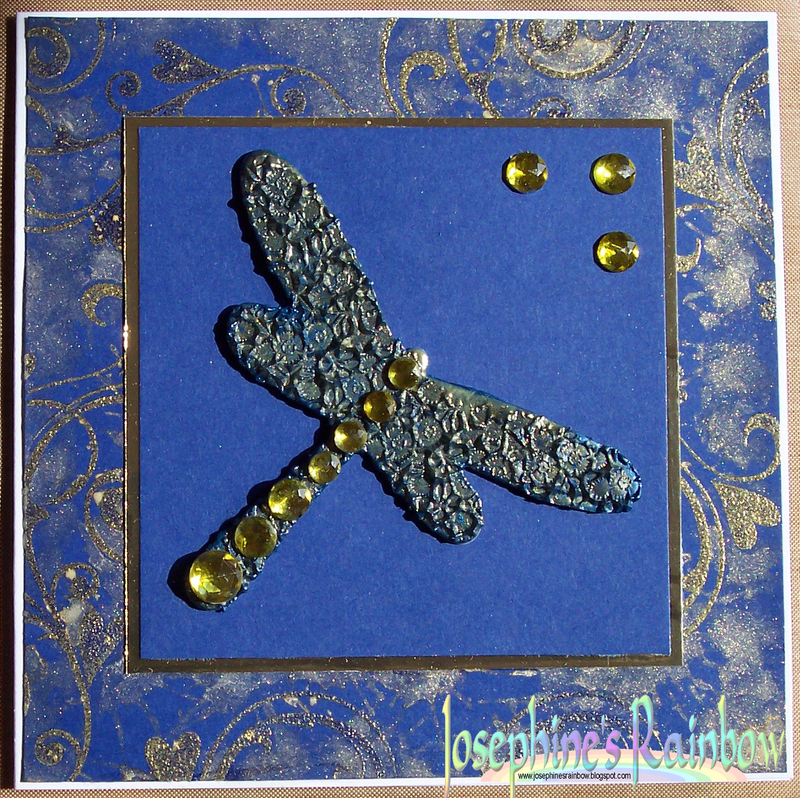 I finished the dragonfly with some Promarker coloured sticky gems. 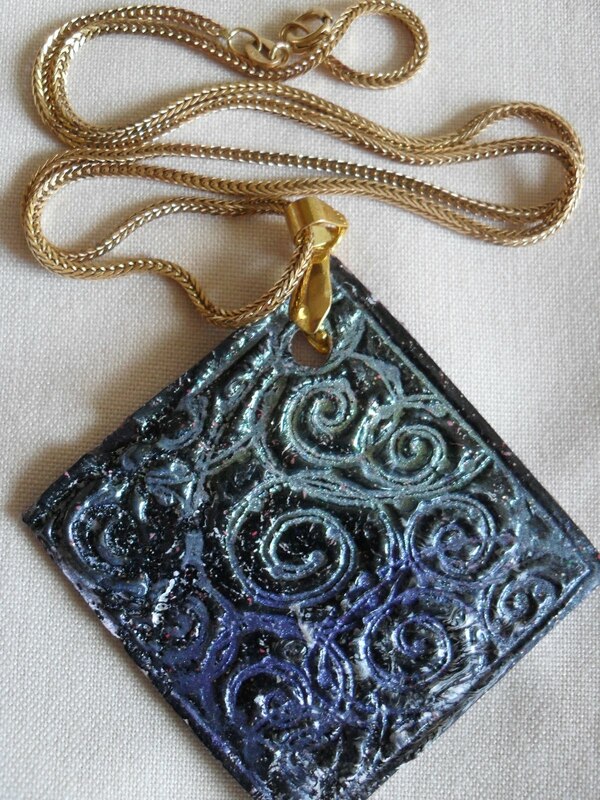 I decided to make a deep embossed pendant. I started with a 2" sq piece of mountboard, which I coloured with a black marker pen. Then added 3 layers of clear UTEE (Ultra Thick Embossing Enemal), whilst the last layer was still very hot and molten, I stamped it with a stamp I had previously prepared with Versamark clear ink on it. After the piece of card had cooled, I removed the stamp, at this stage if your not happy you can melt the UTEE again, and start to stamp again. Once cool, I stamped with Versamark again and brushed on two mica colour powders. Brush it clear, then pat onto a wet wipe to provide the moisture for the mica powders to be set. Add a jewel finding and a chain. Apart from the gold chain, a very cheap, yet attractive piece of jewellery. I decided on dry embossing for this challenge using my bigshot and embossing folders. I used a very cute Wee image that I coloured with Promarkers, Derwent pencils and Sansador. The paper is a freebie from a magazine and I chose pearl card to emboss as I love the effect it gives. I used a Magnolia Doohickey border die to edge the blue card before I embossed it. I then added a few flowers, made with an xcut punch and embossed. 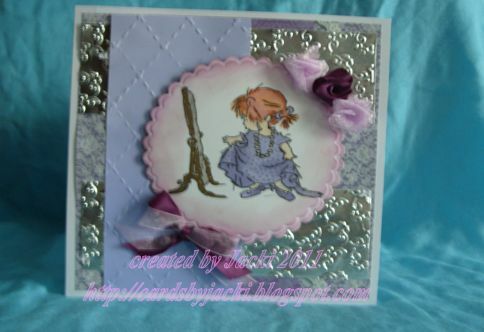 A craftwork card sentiment, some ribbon, charm and pearls to finish. For this wee Challenge I wanted the Embossing to be the main focal point so I stuck with white and a touch of colour! 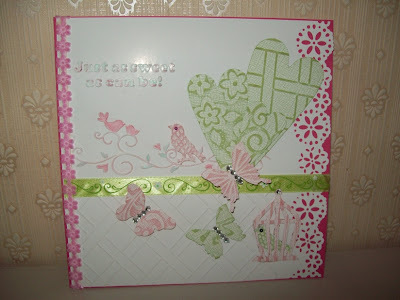 I used my embossing folders for the panels and some hand embossing on the background! 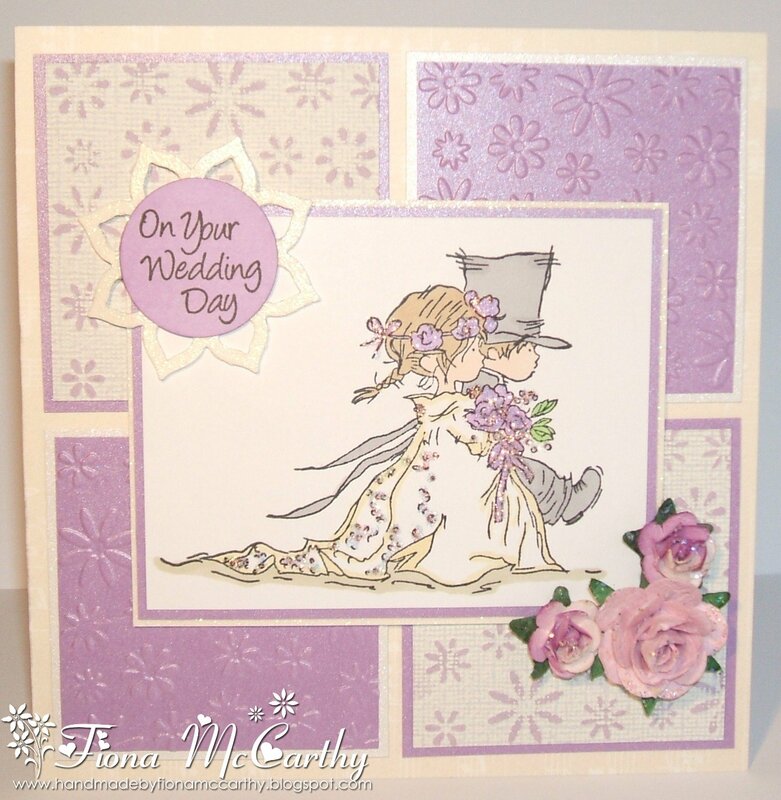 The image is coloured with promarkers and some embossed flowers, card candy and a sentiment to finish. For this challenge I've gone for a double-whammy! LOL. 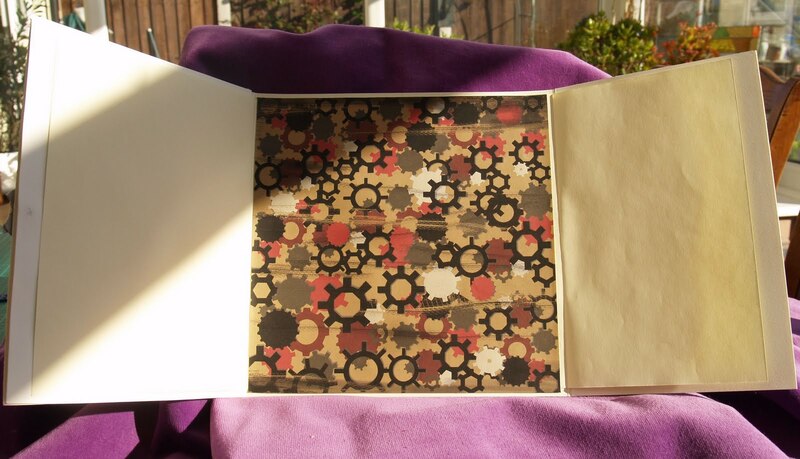 Firstly I heat-embossed my image (CI-210) with Black deail embossing powder. I coloured it with some lovely Starburst Stains Then I added a little bit of Cuttlebug Embossing (D'vine Swirls folder) behind the image. ...shock horror..! Eiglas has done a pretty card....! LOL! Look closely and remember, it may not happen again for a while! Embossing you wanted, embossing you got - all three kinds although I did kinda cheat with the wet embossing and used a glaze pen! LOL! I made an altogether different project then decided not to use it so it was 4.00 am when I finished this one! 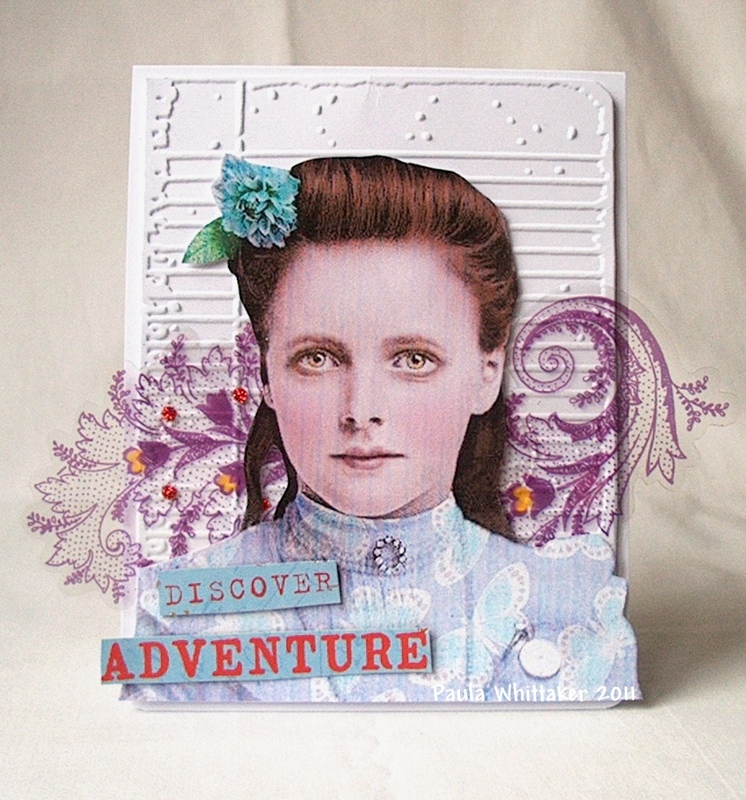 Good Afternoon and welcome back to another challenge at Crafty Cardmakers! We've had a makeover as you can see to give us a fresh new look and we also gave the Spotlight Challenge a makeover too, pop over and see what's going on there too! Firstly Thank you for your dazzling array of entries to our Royal Wedding challenge, lots of red, white and blue going on there! Did you all watch on Friday, wasn't she stunning! I've also learnt what a fascinator is and am still laughing about Princess Beatrice's lol! We're also changing when we post winners so winners of Royal Wedding will be posted weekend of 14th/15th May. Don't forget to check the rules as we have changed them recently, they are in the tab above! 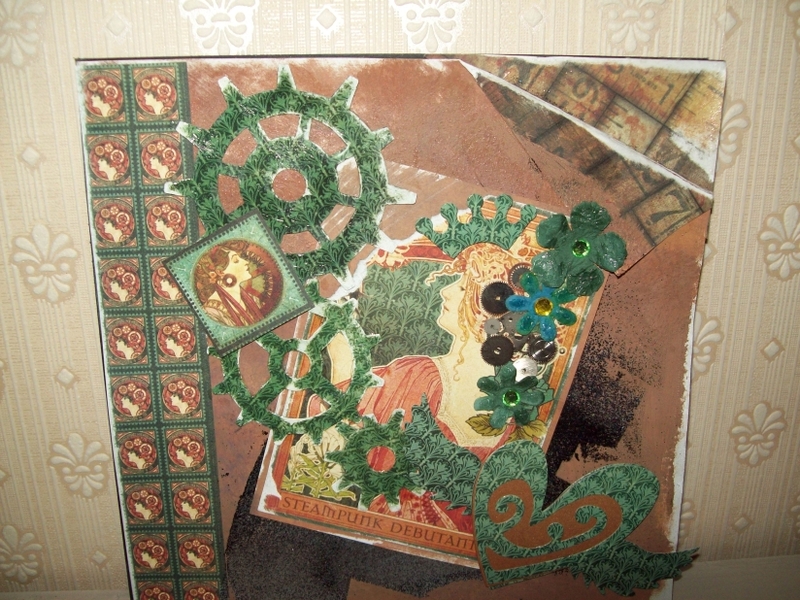 Ei has chosen the theme for this fortnights challenge and she would like to see Steampunk or Machines! Before you all run away screaming have a think about this one and perhaps step outside the box ;) There are lots of free resources available to print out and have a go and just to help you along if you're unsure what Steampunk is simply think Steam = Old/Victorian and Punk = New/Modern or you can opt for the Machines instead. It's my week to choose the theme and I've chosen the twin themes of 'Steampunk' and 'Machines' which to begin with, slightly scared some of my teamies! LOL! For my project I've made a birthday card for my Hubby Nic in a Steampunk style and with added machines! Full destructions on my blog! 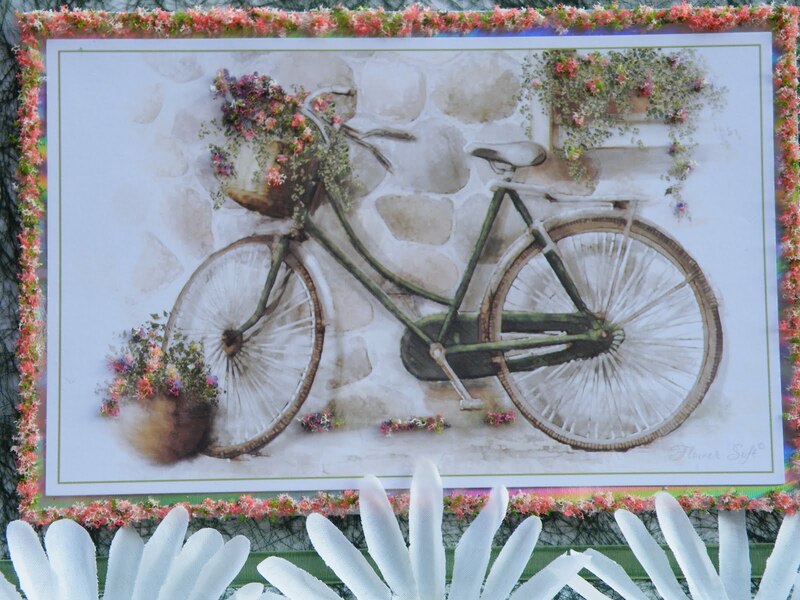 My project uses a bicycle topper from Flower Soft, I mounted it onto holographic card, added a deep border of Flower Soft, used some angel hair I've had forever. 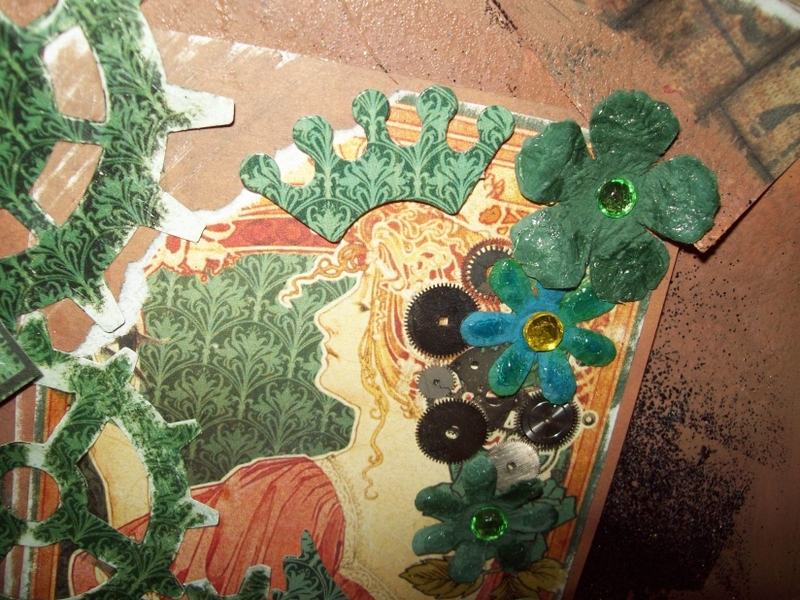 I used some more of my bargain flowers with some pearl brads and flattened bead caps for the centre. I tried to do steampunk and struggled with it so went for the alternative. Ok so this is my first attempt at Steampunk and I really enjoyed it :) It's totally not my normal style which is cutesy so it was quite challenging. The girl is a digi stamp called "Steampunk Lady Audrey" from an Etsy shop called The Octopode Factory. 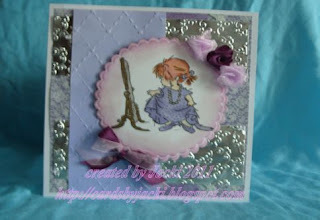 The paper and tag are from a digi scrapbooking kit (can't remember where its from sorry) I have watercoloured the image. Now the cogs.....they took a long time to make lol I used peel off sticker cogs and traced them onto some shrink plastic,cut them out,shrunk them down, then I put some clear embossing ink on them and then heat embossed them with either bronze or silver embossing.I punched the butterfly and also embossed it with bronze powder and added glitter for its body and trail.Finally added some screw brads, ribbon and heart and key charms all from my stash. Oh boy did I love doing this challenge!!! 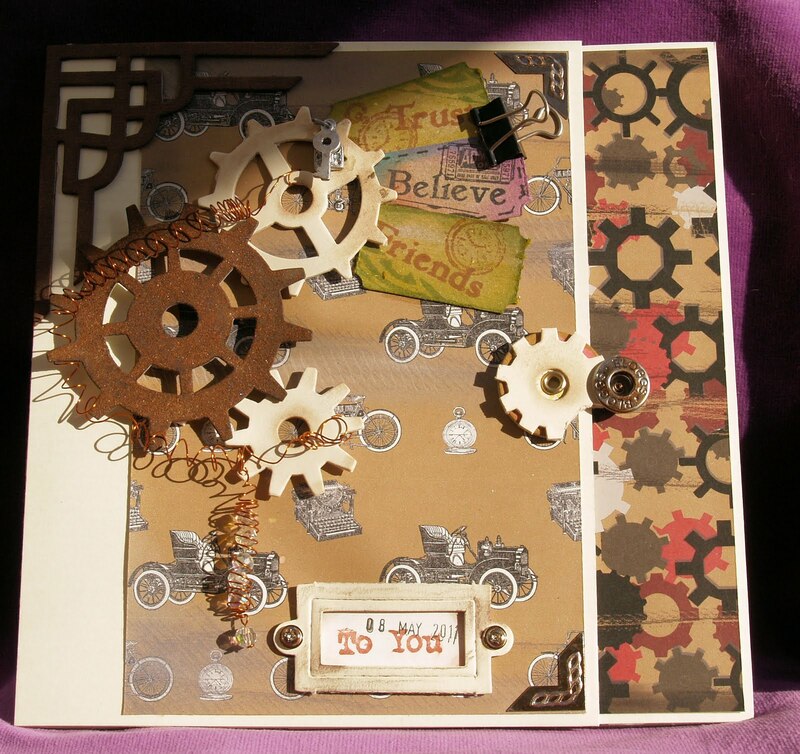 First I made a lovely Steampunky box using lots of paints, sprays, tissue, stamps and of course Tim Holtz Dies with a little rose from Primark on the top. Then I went to town and made my necklace to go with it. I shall put lots of pics of these on my blog so you can see the details. This was a real challenge for me! Not only did I not know what Steampunk was I had no idea what to do! So after a few hours browsing the net I came across some fantastic ideas! I took a bit of MDF Hubby had lying around and just went wild! 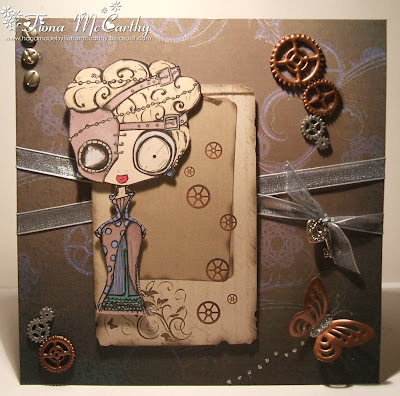 I used papers, Tim Holtz distress inks and embossing powders and gloss! Dug out my jewellery making stuff and strung beads and bits together, stuck down everything and coloured a wee image I found called Steampunk Lady Audrey with promarkers. Then I added some faux stitching to finish it off. 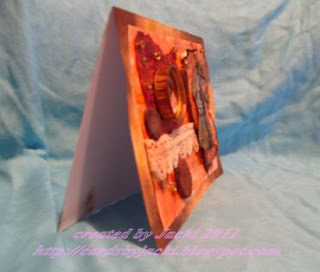 Well,this is my Steampunk styled card, Ive used a red base paper from the DCWV Mariposa Collection and then all the other elements/images are from the Graphic 45 Steampunk Debutante Collection. I was a little intrigued what I could do for this challenge and then I found a digi artist called Teri who sells her images under the name Delicious Doodles. I just love her stuff! Some of it is a bit 'darker' than other digis and she does some fab steampunk designs. 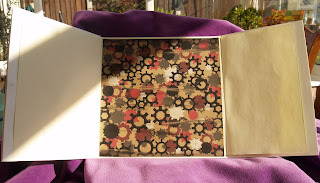 The image is trimmed and placed onto a piece of embossed and sanded coredinations paper and the black and white paper behind is from stash. 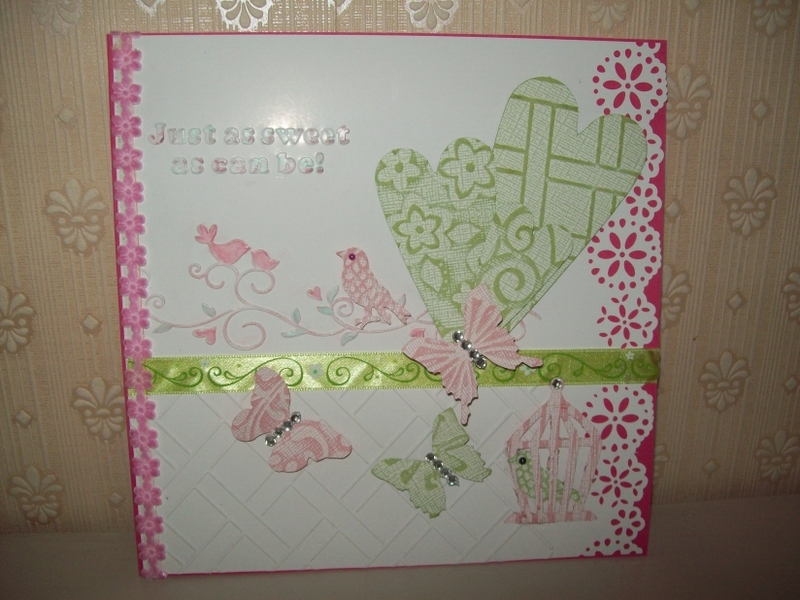 I created the background myself with some scraps of black lacy material and simply stretched it over card. The finishing touch being some cogs made from a template and coated in metallic perfect pearls. I was also a bit worried by this one and intrigued and was thinking of doing a victorian lady on a rocket but then found I'd given my victorian lady stamp away in my last clearout lol! Judie pointed me to some freebie links on her forum which then led me to a favourite hangout - DeviantArt so I searched for "Steampunk Lineart" and found this stunner by SUREYA. You'll find her Steampunk girl here. She is of course a mix of the very Victorian dress and gun mixed with the very modern chibi, love it! I've coloured with promarkers and derwent coloursofts using papers from Bearly Mine who have a great cogs one in the Boys Zone collection. Have fun with this one, we were a bit nervous too but glad we took the plunge!